Douglas Fir is also known as British Columbian Pine or Oregon Pine (trade name), although is not actually a pine species. Native to the West Coast of North America and now also throughout Europe. Indeed, in the U.K., when the veneer is produced from grown trees in North America they usually refer to it as Oregon or B.C. Pine, and when that logs come from Europe as Douglas Fir. Douglas Fir is characterized by its medium texture and straight grain. In addition, its fibre is usually straight, however it can also be wavy or coiled, and the grain ranges from medium to coarse or thick. The colour of sapwood varies from white to creamy white or reddish-white. The heartwood varies considerably from yellow or clear reddish-yellow in trees with tight growth rings and close to orange red or dark red in trees with wide growth rings. Due to this, sometimes Douglas Fir is known as Yellow Fir or Red Fir. An ideal alternative for any kind of application. 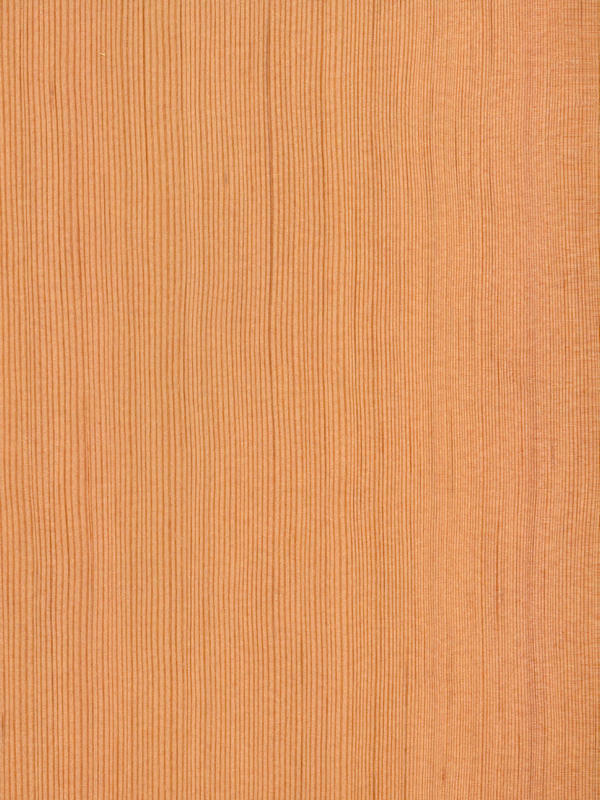 Douglas Fir Quarter Cut veneer is used extensively for fine interior joinery, shopfitting and furniture. Other common applications include general house framing, flooring, lining, fascias, bargeboards and pergolas. Moreover, we have to take in consideration the different application of the logs depending of its origin. On the one hand, a large proportion of available american logs are rotary-cut for use in the manufacture of plywood. For decorative veneer they are usually quartered to produce material that, at its best, is very straight-grained, with the prominent growth rings showing as fine, reddish-brown lines overlaying a basic yellow brown to biscuit colour. Occasionally some smaller logs may be flat cut to produce crown veneer. On the other hand, the european grown logs are, again, mostly quartered and typically show a much wider grain, the annual rings being wider apart. Due to this, Douglas Fir Quarter Cut is an ideal alternative for architects that are looking for wood of estructural use with the best quality, or even for designers that appreciate the rich esthetic characteristics of this veneer and its noble response to the craftsmanship and finishing positions therein. Douglas Fir has won the respect of people in the industry around the world, continually fulfilling their needs of high performance material.